The club has recently taken delivery of a GIANT track bike from BW Cycles on loan for 2016 for use by one of the Academy riders. Doug Hall remembers the importance of having good equipment when he started racing as a teenager, so after hearing about how we are helping to develop young riders contacted us to see if he could help one of our young riders by supplying a Giant track bike. The bike will be used by one of the academy riders and used in competition at national level throughout the season. Academy manager Dan Coast said "Were extremely grateful to the BW Cycles and to Doug in particular for making the bike available on loan to the academy for 2016. 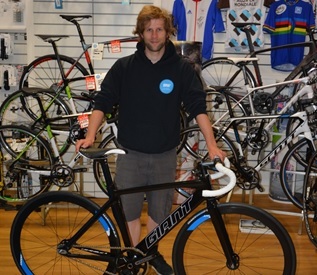 The club have a small fleet of entry level track bikes which are starting to look a little tired so this is a very much needed & welcome addition to the kit offered to the riders on the programme."